With talk of a £billion revamp for the city centre in the air I’ve been reflecting on the changes made to ‘town’ during my lifetime. I have happy memories of childhood visits in the mid to late 1970’s and early 1980’s. It was my mum who was the first to tell me with some pride that ours was the first large scale pedestrian shopping precinct in Britain. In this relatively short space of time there have been many changes made to the heart of our city – some minor, some major; some good and some horrifically bad. A journey into town from our neck of the woods usually started with us catching the No. 22 bus outside the Chace Hotel on the London Road. Uniform burgundy seats; smoking compulsory upstairs; no cameras to prevent vandalism and bus conductors who gave change when a ticket was purchased. The bus would make its way through Whitley past the hospital (where Asda now stands) and the zoo (Warwickshire Health & Racquets Club) before skirting the common and entering Cheylesmore. Mile Lane and the single-lane bridge over the West Coast mainline railway were reached via The Mount. Across the bridge was the industrial stronghold of Parkside. Coventry Climax – famous for its fork lift trucks – greeted you on the left and the vast Rolls Royce works was on the right. The Elm Bank Teacher’s centre is just about the only building from that era that remains in its original form. ‘BOYS’ and ‘GIRLS’ were clearly visible above some of the doors harking back to its days as a school. At the end of Mile Lane was Rotherham’s, the frontage of which is now the Ibis hotel – a building steeped in industrial history as cars and bicycles were once manufactured here. From here the outskirts of town were visible just beyond the Martyr’s Memorial cross. The blue dome (recently restored to its former glory after being a rusty kind of blue for many years) crowning the stairwell of the New Union Street car park is something that captured my imagination as a child – I once painted it at primary school when the teacher asked us to paint something we associated with Coventry. With the ring road crossed the bus would turn into Little Park Street. No magistrates court in those days and on the right I remember Kirby House being derelict for many years. Eventually - sometime in the late 1980’s I think - it was restored after a long campaign to save it from demolition. A left turn at the Council House, where I would usually try to glance at the clock, and we would enter High Street with its banks and building societies. It hasn’t changed much but back then the ‘Earl of Mercia’ pub was a bank and what was up until recently ‘Yates Wine Lodge’ a furniture store. The bus would then enter and stop at Broadgate, the ancient heart of the city where a castle once stood. No Cathedral Lanes back then. No silly tent for the Lady Godiva statue either - she sat proudly in the open air surrounded by greenery (Thank goodness the tent has now gone!) It wasn’t exactly the Chelsea flower show by any means but provided some colour and relief from the uniform brick buildings surrounding it. In the vicinity I seem to recall a ‘wishing well’ where spare coppers were despatched in the hope of something nice happening. Then as now tourists took photographs of Lady G astride her horse and also of the famous clock just across the road. My mum said that the city planners promised a clock to match the best that Germany could offer (Germany being famous for fancy clocks of this nature) and we ended up with something that looks like it was knocked up in half an hour by chimpanzees! That said you’ve got to love it. 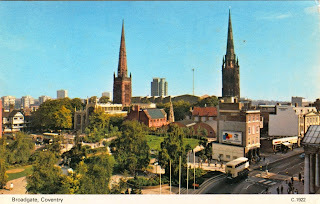 It’s classic Coventry. Like the tourists, all Cov kids visiting town will have stopped to watch it on the hour at some point, when Godiva, looking somewhat like a blow-up doll from an adult shop, emerges on her white horse. When she is half-way Tom the Tailor appears and removes the hands from his eyes to catch a glimpse of her in all her glory. If he finds peeping at rubber dolls a turn on I wonder what he’d make of a real woman!! Owen Owen was the flagship store in those days occupying the building that is now home to Primark. I don’t remember too much about it other than at Christmas one of the upper floors was turned over to toys and Coventry City F.C. often had a temporary ‘Sky Blue Shop’ there for the festive season. Much as I like Primark you have to question the wisdom of having a glorified £1 pound shop in this location. 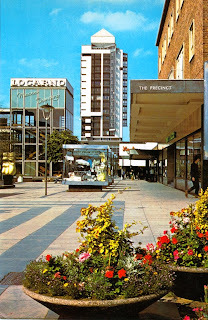 The Hotel Leofric – now a Travelodge – was next door. The Upper Precinct has seen a few changes since my childhood. The ramp from Broadgate wasn’t there for starters. Underground toilets were near the top and fountains once spurted water below the raised walkway near M&S. The armed forces recruiting offices were located in the back of Broadgate House and were visited occasionally for free giveaway stuff such as posters of Army cap badges. With no West Orchards it was also an escalator free zone. Not wishing to go on a rant but that escalator is one of the biggest eyesores in the city centre and completely unnecessary given the already mentioned ramp which leads to the same place. When the precinct was built it was to a plan which centred on the spire of the old Cathedral. The escalator ruined this and it begs the question: What were the council planning committee thinking when they approved it? If the escalator and Cathedral Lanes are massive mistakes then something they did get right is the redevelopment of the Lower Precinct. It’s a massive improvement on the old days. I remember it as being dark and dank. Shops such as C & A, City Pram Co., Robinsons Florist and Gibberds existed down there. City Pram Co. had a pram in one of the display cabinets that used to stand at the heart of the precinct. Many school uniforms were sold by Gibberds – I’m sure all my Whitley Abbey clobber was purchased here. 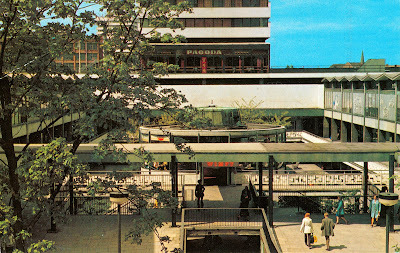 A night club once occupied the 1st floor of T.J. Hughes and the famous Pagoda Chinese restaurant was located in the tower block at the end of the Lower Precinct (Mercia House). The best thing about the Lower Precinct was the round café, which was sensibly retained in the revamp. Was always fun eating here and watching the shoppers down below. I remember it being a Wimpy – more on them later. I think one of Jackson’s barber shops was located here too – possibly upstairs. Always had my hair chopped at Jacksons as a youngster – either here or at their shop in The Burges. Smithford Way has seen some changes too. Michelin Men style sculptures and an outdoor chess board with pieces the size of small children could once be seen here. The chess pieces came from the nearby Davies Sport Shop. Davies’, like all sport shops back then, was a proper sports shop and not one of those glorified clothes emporiums that masquerade as ‘sports’ shops today. In one of the above images the famous Locarno dance hall can be seen. It was Tiffany’s in my childhood where groups like The Specials cut their musical teeth. Today of course it is the library. (The old library, where I discovered the delights of Thomas the Tank Engine etc., was housed in a building next to Holy Trinity church which was demolished to make way for Cathedral Lanes.) Also in Smithford Way was Coventry’s best shop for children – Barnbys Toy Shop. A floor for boys (Meccano, Lego etc.) and a floor for girls (Dolls, Dolls & more Dolls!) if memory serves. For me, this shop wasn’t properly replaced until the arrival of The Entertainer in the modern Lower Precinct. (Supporters of Goldies might argue the toss about this I guess.) Another must for children was the pet shop with its fish and talking parrot. A pub called ‘The City Arms’ also once graced this part of the precinct which I obviously didn’t visit as I was too young. Opposite Smithford Way is Market Way, which was up until 2 January 2008, home to Woolworths. (R.I.P. and good luck to all the staff in finding new jobs.) A ‘must visit’ store for children especially at Christmas when the basement was turned over to toys. A bite to eat was often had in the upstairs restaurant in Woolies. Just past Woolworths another of the ‘lost pubs of the precinct’ existed – the ‘Market Tavern’. After a stint as a Burger King it is now a Halifax bank. For school shoes (money permitting) it was a visit to Clarkes where I always enjoyed having my feet measured properly. At the end of Market Way is Shelton Square and just beyond that the City Arcade. I’m not sure of my geography but think the ‘serious’ toy shop was round here. The serious toy shop being Midland Educational. Wherever it was it sold all the boring stuff (microscopes, chemistry sets, rulers, pencils etc.) and my heart sank if I knew we were going here. One of the legendary features of town was the ‘bird cage’ in the City Arcade. It stood outside the board games shop and the bar which I think calls itself ‘Heat’ but will always be ‘The Bug and Black Bat’ to me. This aviary rose to roof height and the birds were always a big attraction. They should put it back but I suppose it would probably contravene ‘animal rights’ or something these days. (And it would be interesting to see what sort of ‘birds’ they could put in it given the proximity to Heat!) Argos seems to have been in that location forever – remember going with my parents to buy an Atari VCS from there for the princely sum of £100 back in the early 80’s – but suspect all of the other shops have probably changed hands numerous times in the intervening years. Another ‘proper’ sports shop called Aubrey Hill once graced this part of town. ‘The Thistle’ pub used to be located above or next door to Argos and entrance was via a flight of stairs. The Market, which has recently celebrated its 50th birthday, once had a roundabout that was outside rather than inside – another compulsory attraction for kids. 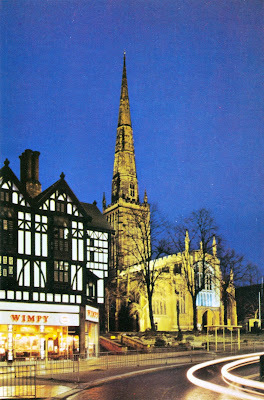 The Bull Yard, which in recent years has been successfully transformed into a ‘restaurant quarter’, was famous for having a small newsagent’s which was housed in a dome – more classic Cov!!! The much missed Intershop was also in this area. Various small diverse outlets housed under one roof. Intershop made way for the much heralded Litten Tree public house which has only just re-opened after being closed for a number of years now. What a great move that was - NOT!!! Hertford Street was home to the ABC Cinema which is now the JJB Sports shop. I remember seeing Superman here. If memory serves it had two screens; the main one and a much smaller one. The ABC was my favourite of the three cinemas in town. The crowning moment of any trip to town for me as a child was a visit to a Wimpy restaurant. The food looked exactly as it did in the menu pictures and tasted even better. 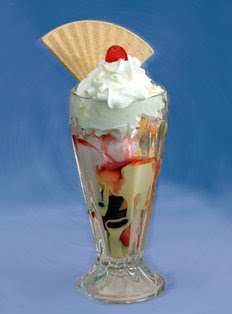 The bendy frankfurter sausage that stretched round three quarters of the plate was good but nothing could compete with dessert – the Knickerbocker Glory. This was the best ice-cream Sundae money could buy! Ooh la! la! Wimpy also had to-die-for milkshakes thanks to the use of Crusha syrup. The round cafe in the lower precinct and part of what is now ‘The Flying Standard’ (Wetherspoon’s) were both home to Wimpy. I think they may have had a third outlet in Ironmonger Row. Competition for Wimpy came from Fishy Moores and The Chestnut Tree which were both near the then ramshackle Pool Meadow bus station. Neither could ever match Wimpy though. Almost exactly the same memories as mine although mine were a little earlier! I remember the chameleon in the pet shop - had forgotten its existence until I read this. I caught the 17 from Baginton into town and up through Hertford St. I cannot understand why they have demolished the library - it was the most wonderful place on earth to me - modern libraries cannot compete in my opinion. Thanks for the memories. Did you know that you can generate money by locking special pages of your blog / website? To start you need to open an account on AdWorkMedia and embed their Content Locking widget.